Ars Novas nyeste jule-cd, udgivet sammen med Theatre of Voices er af flere anmeldere blevet fremhævet blandt årets bedste udgivelser. Den er inspireret af den kendte og populære engelske tradition, som på dansk kendes som 'De ni Læsninger'. Musikken stammer fra Italien, Tyskland, Danmark, England og USA, og cd'en rummer bl.a. en række fine arrangementer af Ars Novas chefdirigent Paul Hillier. Cd'en var på både Politikens og Berlingskes liste over bedste klassiske indspilninger i 2011. Ars Nova Copenhagen sing the larger-scale pieces, with an unerring ability to sound idiomatic despite the diverse range of languages and musical styles. Hillier’s repertoire choices are bold and beautiful... The performances are outstanding... These days it seems that everything Hillier touches turns to gold and this album is the latest that benefits from his Midas touch. Brilliant singing, innovative repertoire choices and sterling sound quality make this everything you can possibly want from a Christmas album, or any other album for that matter. A collection of plainchant and traditional carols from Italy, Germany, Denmark, England and America to tell the Christmas story. A sparkling German carol, “Liebe Hirten”... and what is surely the Rolls Royce version of “We Three Kings. 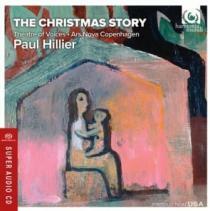 Paul Hillier is a reliably inventive conductor with an ear for fine choral singing. The Christmas Story (Theatre of Voices, Ars Nova Copenhagen)… gives the whole story, from Advent and the Annunciation through Epiphany and the Holy Innocents, along with an ‘epilogue’ of secular favorites, concluding with figgy pudding. [An] unusual and unusually attractive program... The performances, divided among Hillier's Theatre of Voices and Ars Nova Copenhagen, are beyond criticism. Luminously recorded in Garnisons Kirke, Copenhagen ‘The Christmas Story’ is not only the ultimate stocking filler but an essential addition to your Christmas music collection. This stunningly beautiful record is inspired by the famous Nine Lessons and Carols service. (...) With the inclusion of an essay by Hillier, a Thomas Hardy poem, all the sung texts, paintings and photographs, the presentation is exemplary. As collections of Christmas music go, this one stands out, not only for the impeccably refined and expressive singing, but for the immense breadth of the material it contains. (...) The highlight, for me, is Ars Nova’s beautifully shaped reading of Byrd’s O magnum mysterium. Hillier’s groups do more than perform music brilliantly; they get out of the way of the music and let it tell the story. Ars Nova Copenhagen sing the larger scale pieces, with an unerring ability to sound idiomatic despite the diverse range of languages and musical styles. this year’s most imaginative variation on the seasonal disc theme (...) light, airy and expertly balanced accounts of 20 items from plainchant to ‘We wish you a merry Christmas’. ...something of substance to lighten the dark nights. The Christmas Story is a treasure...Hillier's stellar forces and the matchless harmonia mundi team have outdone themselves.